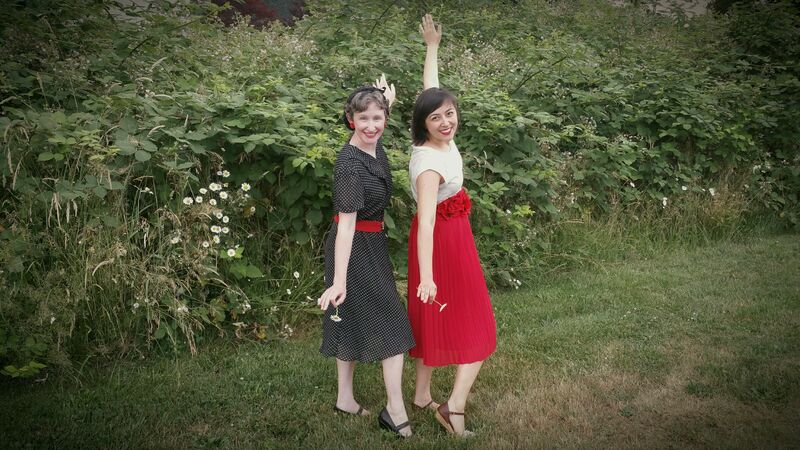 With Halloween around the corner, it’s the perfect time to create vintage fashion magic! This month we will feature some of our favorite tutorials for turning thrift store clothes into old-time fashion statements! Wear them to a costume party or wear them everyday! Today’s post highlights dresses that were originally made in the 1980’s but have lots of of 1940’s flair! 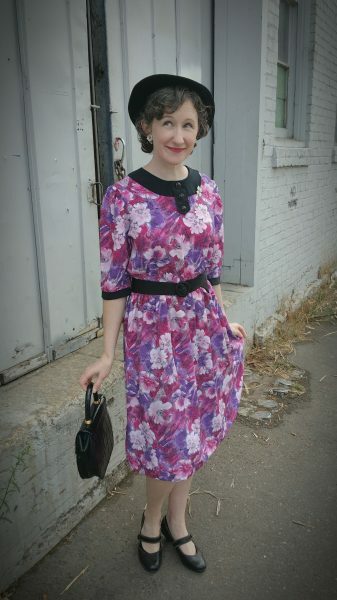 My first dress needed very little work to give it swingin’ style! Remember this dress from our “Week of 70’s and 80’s Dresses“? The only alteration it needed was the obligatory removal of the shoulder pads. (Hey, the 1980’s called and wanted them back!) 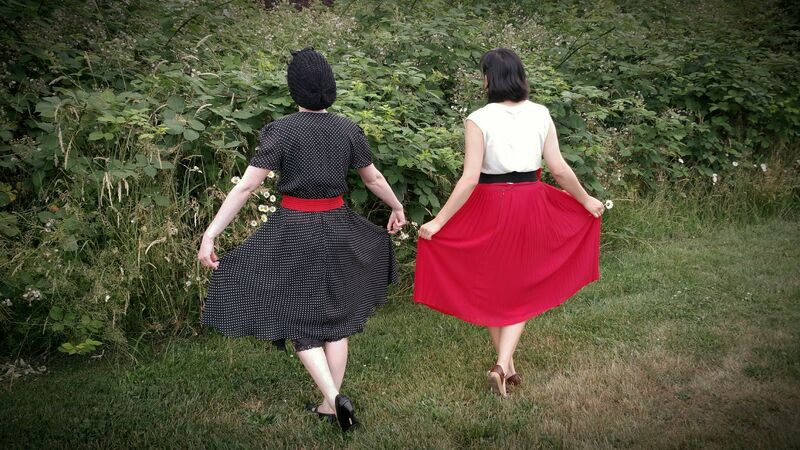 The puffed sleeves, fitted waist, and below-knee length are 1940’s-ready all on their own! Of course, it’s the accessories that really take this dress back in time! The hat, bag, and belt are vintage finds from a local thrift store called Crossing the Jordan! Coincidentally, that’s also where I found the dress! I was so excited to find this vintage enamel jewelry while thrifting, as it’s hard to find! The statement flowers play well with the statement flower print of the dress. 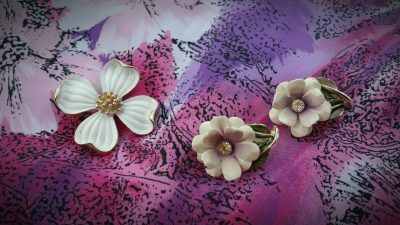 Fashion Tip: The 1940’s ladies loved their brooches and clip-on earrings! The shoes are also a thrift store score from years ago, but you can find similar here. My next 80’s dress needed a little more love before it could really shine. Check out the tutorial here to witness the full transformation! This dress is now one of my favorite refashions! 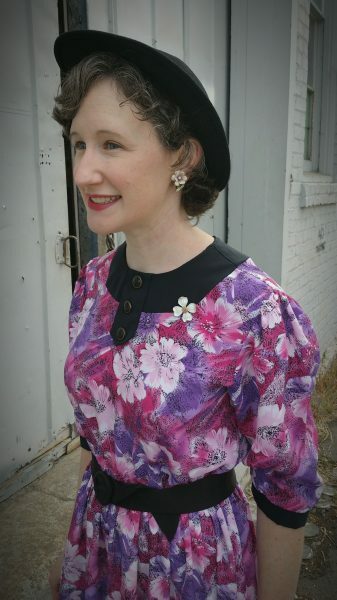 My fabulous friend Katherine agreed to dress up for a 40’s-style photo shoot! 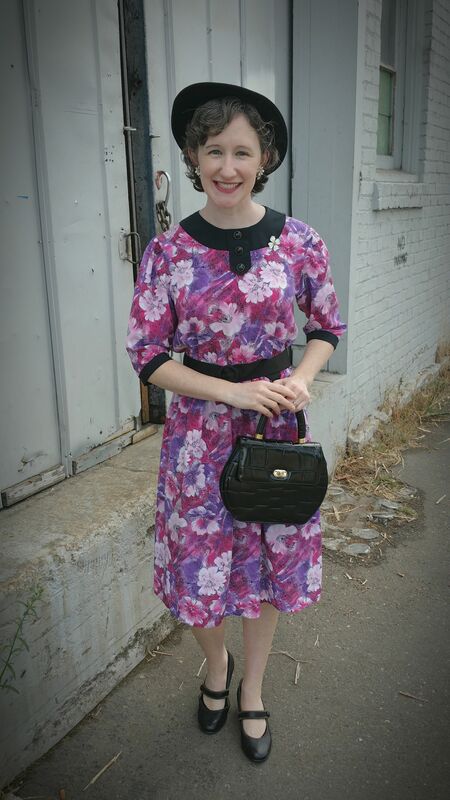 Believe it or not, her outfit is NOT vintage but has lots of vintage flair! 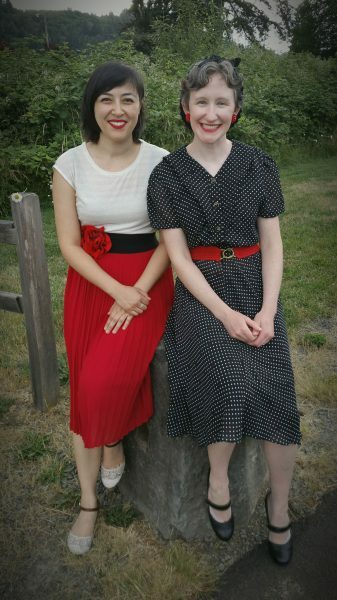 Fashion Tip: 1940’s ladies loved fitted blouses, skirts that reached around knee length, and snazzy belts! And you know what they loved even more? Red Lipstick and lots of it! 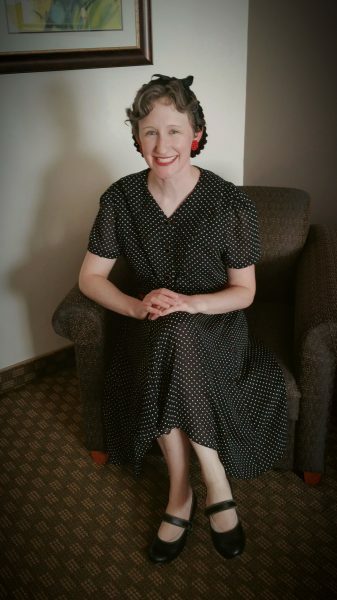 Check out this fascinating article from vintagedancer.com for historical makeup tips and tricks! If you can’t find a 1940’s hat or simply want to cover a modern haircut, you can make your own “snood” hair net! Check out my tutorial here for what may be my favorite vintage accessory DIY! Daisies are optional extras. 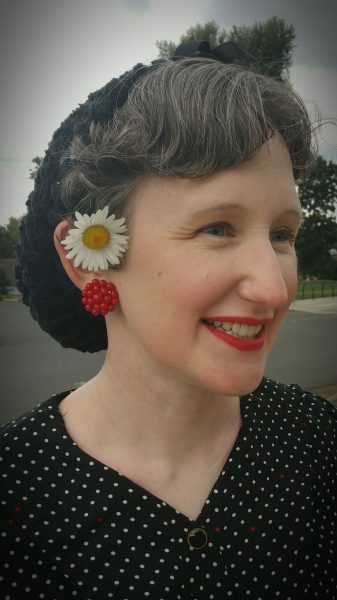 Here are some 1940’s-inspired accessories to get you started!